It is noted, in the history of our church, that everyone experiences the Spirit in different ways. Some in silence, some in rousing music, some in prayer, some in worship. The music in our church has long been a part of our worship and is as different in each service as the worship services themselves. The music is a ministry that has drawn us together in our differences and our similarities. From traditional hymns and gospel music to contemporary styles, we sing from the heart in a joyful noise. We come together in praise from choral-led songs to band-led modern music that we sing boldly and gladly along with others in our church, in our cars, and in our homes. We find that music brings us together. Often, those who have not yet found their place in the church may find that the music brings them back or provides them with a direction in finding their search for a church home. Just as the music styles have meaning and a place in our hearts, the different styles of worship have inspired devotion and attendance by bringing like-minded people together to hear the word of God in a way that they can relate to and where they can hear the message of God’s love for them. These gifts of varied styles of worship have come from the pastors who have loved this congregation in their own personal styles of delivering the word, to the lay leaders who step in to fill our hearts when our pastors are away. With each, we’ve come together to hear the stories of the Bible unfold in a very personal message to our hearts that God is alive in us, for us to share with the community and the world. The Sanctuary choir was formed at the home of Cynthia and Larry Bradley. Cynthia was our choir director and then Kathy and Ted Shaw joined, and Kathy served wonderfully for several years. I started the Cherub Choir because I wanted Caitlin to be in one. Others that were cherubs are Casey Bryant, Brett Williams, Katie and Clay LaPoint, Courtney Reese, Darin Coppedge, Jacob LeBlanc. Then we graduated to Children's Choir and on to Youth Choir. We had lots of kids, and all the parents were super supportive! We sang in worship often, and when we decided to buy red robes for the kids, they were paid for in a week. I still have my songbooks from that time period, and I do know where most of those are located. Wouldn't it be fun for them to all come together and sing again? We also had a singing group we dubbed "The Believers." Emmett Eary, Dale Loyd, Lane Timm, and I sang at several events in the couple of years we were together (late 1980s). We had a lot of fun and it was a joyful experience! Ted and I and our two teens started attending PFUMC in the fall of 1984. A couple of weeks before Thanksgiving, Barbara Johnson called to make sure we knew we were invited to the fellowship luncheon the Sunday before Thanksgiving. I told her we planned to attend and that I also was going to join the choir. Her next question: "Do you read music?" Her second question: "Will you be our new choir director?" She went on to explain that Cynthia Bradley, who had served so well as director, had some health issues and would be resigning after the Christmas season. I hedged since (1) we weren't yet members, (2) I hadn't even been to choir practice, and (3) I had never directed a choir. I went to choir practice the following Wednesday and found myself introduced as the new director. I agreed to serve temporarily until they could find someone more qualified. Thirteen years later . . .
During those 13 years, our small volunteer choir and I did our best to lead the music for worship and to raise our voices in joyful praise. The music wasn't "high church" but rather a mix of everything from bluegrass (Ben Wolf's favorite) to gospel, praise, and traditional, with Christmas cantatas and the "Hallelujah Chorus" thrown in. We sang with enthusiasm. During those years, a number of accompanists came and went, but Andra Lehmann was always ready to step in to fill the gap. She and I used to laugh about what we were trying to do in God's name. After serving for 13 years, God called me to step off that path of service and to be involved in the Stephen Ministry. I can honestly say it was a mighty struggle for me to give up serving as music director, but there just wasn't enough time to continue leading the choir and to start another ministry from the ground up. I asked Tammy Rebecek to step in as choir director, and she agreed. Thankfully the Stephen Ministry flourished, and the real number of people whose lives have been touched will never be known. But I look back on those 13 years of music ministry with warm, warm memories, and a bit of longing still in my heart. For many years, PFUMC had a strong children's choir for grades one through five. Even in the fire hall in 1983 the children sang for worship. Doris Ostroski led the group for several years. When she retired, I took over leadership for about two and a half years. Thinking the group needed better branding, we coined the name Praise Power and got T-shirts for everyone. The group sang during worship services and performed a Christmas show. Some of my most memorable and rewarding years in my adulthood and church life, at any church, were our years directing the Praise Power choir (grades one through five) at Pflugerville First United Methodist Church. It was supposed to be a one- or two-year stint for my wife, Karen, and me, but it turned into a wonderful seven-year ride! I had been blessed with being a part of a great church musical program in my youth, so I wanted to help provide the same for the PFUMC kids. It was made extra special for us that our at least one of our two daughters (Marissa and Sydney), who were five years apart, were in Praise Power all seven years. The first year for us, the Praise Power Christmas pageant was a simple script I found in a Christian bookstore, and we found old Christmas classic songs to go along with it. From then on, each year we tried finding more challenging Christmas musicals, written specifically for children's choirs, many of which were written and produced by Brentwood Music out of Nashville. And, although the accompaniment CD and individual tracts brought on added costs, the popularity of the Christmas pageants made getting extra financial support from the church and parents a given. Sometimes, even though this was a church children's choir, getting a solo or part in the Christmas musicals became very competitive, and a parent talk or two arose every now and then with us being told that if a certain kid did not get the part they wanted, not to expect them to be in the musical. We did not let this deter us, because what that meant was we had created something that was popular, fun, and that we were providing some quality music and team-oriented growth for the children at the church. Kids looked forward to joining Praise Power and there was excitement as to what the Christmas musical would be. We looked forward to how we could improve from year to year. In addition to the Christmas musicals, Praise Power sang at three worship services in the fall and spring, with the final performance each spring usually including as many as three or more songs. Each year also brought a different color and design to a Praise Power T-shirt and an annual year-end field trip. In our seven years, we went to Austin's Park and Pizza, San Antonio's Breckenridge Park and Witte Museum, Inner Space Caverns, and three different trips to Waco's Cameron Park Zoo. It was a joy to be a part of such a vibrant program and ministry at PFUMC for those seven years, and I can recall certain rehearsals, programs, trips, and, more importantly, those precious kids, as if it was yesterday. We turned in our director's wands at the end of the 2010 school year, but the memories will always be there! The Cherub Choir for preschoolers was restarted around 2008 by Martha Hodgens, a member of the chancel choir, and Vicky Gregory. The choir practiced during the beginning of Sunday school time and performed at church services for special occasions such as Mother’s Day. Vicky Gregory, assisted by Paul Taylor, led the choir for six years with 8–12 children in attendance each Sunday. The choir transitioned with the implementation of the Orange curriculum to be Singing Time at the beginning of the preschool small group time. The choir has not performed during a church service recently, but the children sing enthusiastically in their classroom. Paul Taylor has led Singing Time for several years. PFUMC has had Advent programs in a variety of formats since the church began. These have ranged from having an Advent festival with craft stations, to Hanging of the Greens, choir programs, children's pageants, ornament exchange, small group dinners or parties, Circle of Hope gifts for children, and Christmas Eve worship. Many of these programs have endured as traditions. The season usually starts with the Hanging of the Greens. This involves a worship service with Christmas music, scripture readings, and decorating the sanctuary with meaningful symbols of the season. The highlight for many who attend is decorating the large Christmas tree with Chrismons (Christ monograms). The children enjoy being lifted up to put the ornaments high on the branches. On Christmas Eve there are always several worship services. They have usually had a different emphasis. One for families with children, a contemporary service, traditional worship, and one with communion. The choir or praise band leads beautiful Christmas music. There is a Christmas miracle offering to support mission work. The services usually end with candlelight while singing "Silent Night." The services are heart warming and inspiring for the community. The Circle of Hope ministry has become a favorite tradition of the season. It is a gift program for foster children. It began in 2010 to replace a long history of involvement with Angel Tree, a gift program for children of prisoners. Happy Brymer and Margaret Pazik have been leaders of these ministries. People select a card off of a Christmas tree in the foyer of the worship space. The card lists the age of a child and type gift requested, e.g. clothes, toy, book. The person then purchases the gift for $25 or less, places it in a gift bag, and returns it to the church to be delivered to the Circle of Hope to be distributed to the child. The Ornament exchange is usually the first Friday in December. Judy Garcia wrote, "The Ornament exchange and Advent festival were both ideas that I got from a previous church in Georgia that I was active in. I had very fond memories of these events and wanted to share them with my Pflugerville church family. My husband, Henry, and I hosted the first ornament exchange at our house in December 1995. I remember the church coming together on those evenings to share laughter and love, and were great for church family building." In 1996 Pastor Frank and Marian Wolf hosted it. 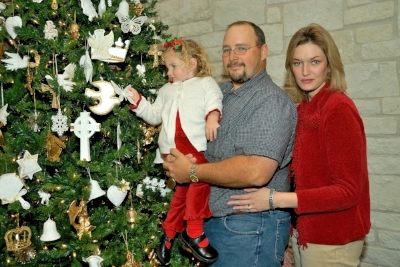 Joe and Linda Scruggs did it in 1997 and 1998, and George and Sandy Tolleson hosted it at their house from 1999 to 2002. It moved to the Family Life Center when the numbers attending became too large. George and Sandy continued hosting it at the church from 2003 to 2014. Clark Meier took over in 2015 until present. It is a time for fellowship beginning with light fare of snacks and desserts. Everyone brings a wrapped ornament to put up for exchange and takes a number. The process followed is one that is commonly called, "Chinese gift exchange." Everyone enjoys seeing the variety of ornaments and there is a lot of laughter. Each person introduces themselves so it is a great way to meet people. My brother, Ross, and I were some of the first babies baptized in the church. I went though all 12 years of school in the church. My mother, Colleen Moore, was really big into all of the Christmas pageants and singing “Joy To The World" and "Happy New Year" at the end. The one that was most popular was Dr. Newheart. We did it three years in a row, and everybody kept the same parts. Tiffany Walker played Dr. Newheart and Jennifer Whitwell played the secretary. It was our biggest production. I don’t remember the exact year, but Frank Wolf was the pastor. He asked that we all sit on the left side the Family Life Center for the service because we were a small group and the more spread out we were the smaller we looked. It was an insightful move on his part. Sitting together rather than spaced apart began to tie the threads together that would become the community fabric of the church. During this time, in early October, the Advent Planning Committee tasked me to come up with a way to have music be a part of the Advent Festival. The festival had several stations where you made things like Advent wreaths, Christmas cards, or poinsettia napkin holders . . . and music was to be added to that. My idea was a recording booth. We set up in the small office just to the right of the entrance to Family Life Center. As the attendees came to the Advent Festival we would encourage them to come in and sing the first line of any Christmas song that they liked and then say the words “Merry Christmas.” We recorded these song clips and Merry Christmas wishes but did not keep track of who sang what . . . so it was fairly anonymous. Over the next two weeks, I then wrote a story that utilized all the song clips that had been sung, weaving them into the story and playing them, via tape recorder, at the appropriate time. The program always ended with each individual “Merry Christmas” being spoken while an instrumental version of Silent Night played underneath. This audio program was usually presented to the congregation on the first or second Sunday in December. I always felt the presentation was serendipitous because, while listening to the story the congregation enjoyed guessing to themselves who was singing which Christmas song. And it was joyful because it was the community of the church sharing with itself glad tidings of Christmas wishes. I enjoyed producing this program for several years and have lots of warm Christmas church memories as a result. From around 2004–2010 I served on the Family Life Ministries Committee, which sponsored family-friendly events for the entire congregation. One of the things the committee was responsible for was the Advent Festival, which included several craft stations as well as the music booth with Joe Scruggs. From 2005 to 2009 I was in charge of planning and organizing the Advent Festival. Instead of doing the same activities every year (but we always tried to make sure Joe was available for music) we had some themed events. The first one I organized this way was “Christmas Around the World,” where the craft stations involved learning about Christmas traditions from other countries. I still have some of the crafts we made at the festival on my Christmas tree. We returned to the “Christmas Around the World” theme again a few years later, and twice the festival was organized around making ornaments for a Jesse tree (as well as making a banner with a tree design on it). One year the theme was “Journey to Bethlehem,” and the craft stations were all designed around something that Joseph and Mary might have encountered as they traveled through the town of Bethlehem. I enjoyed planning these festivals, and I think people enjoyed participating in them. I enjoyed serving on the Family Life Ministries Committee and its commitment to planning and organizing activities for the church family to do together. There have been several outdoor festivals at the church to involve the community. They included booths with games and crafts. These festivals were fun, and they raised funds for ministry. The events usually involved a variety of bands playing. There was usually a T-shirt sold with a design and the name of the festival. Silent auctions were added to these later with baskets full of goodies from members and small groups as well as, contributions from local businesses. At first, these were in the spring and were called March Madness (1992–1993). The name changed to Methodist Madness because it moved to April in 1995–1996. In 1997 through 2000 Methodist Madness was held in the fall. The name was changed to Pfall Pfestival in November 2001. In 2002–2005 it was again held in the spring and called Methodist Madness. There were also Jesus Jam festivals in the fall of 2005, 2006, and 2007. The focus of these was music and involved bands from the church and community. In 2008 through 2012, it was called Pfamily Pfall Pfestival and was held in the fall. After that the focus changed to Christmas in July where the church served a hot Christmas-type meal to people in the community, especially those who received food from Paula’s Food Pantry. Shortly after my wife, Cindy, and I joined the church around 1995, the pastor (Frank Wolf) and Worship Committee decided to start a second worship service with more contemporary music. The service would be held in the fellowship hall, then our only building and worship space. They recruited a guitar player (David Kealey), a keyboard player (myself), and a singer (Colleen Moore). That formed our first praise band. Most of the repertoire came from Christian folk songs from the 1930s through 1970s, compiled in a songbook commonly known as “The Fish Book,” because of the ichthys image on the cover. Words were projected with transparencies, a projector, and a portable screen. The service started with a modest 30 people but after a few years was peaking around 120. The music was pretty high energy, with members usually clapping along. The band regularly passed out a collection of tambourines and other percussion instruments so the congregation could play along. As the service grew, the band added drums, bass, more singers, and more guitars. Over the years dozens of people have served in the Praise Band. It continues to be a very inclusive group. A few years after the Praise Band first formed in 1996, the leader, David Kealey, had the idea to take Christian music outside the church to secular events. The band Pflaming Glory was born. Their first venue was the local town festival—Deutschen Pfest. Over the years, the band's membership evolved, and the group changed its name to Pflame. Twenty-one years later, the group is still bringing spiritual music to the secular world. Venues include town festivals in Hutto and Elgin, weddings, bars (Hanover's), car shows, fundraisers, parades, and more. Past and present members include: David Kealey, Tammy Rebecek, Clark Meier, Andy Whitwell, Ben Wolfe, Barry Day, Jeff Thiele, Skip Skinner, James Minor, Sarah Foster, Kelly Sundsvold, Buck Eacret, Jennifer Whitwell, Monte Marshall, Jim Mergard, Ronnie Brown. Lay servants serve the local church in any way in which their witness or leadership and service inspires the laity to deeper commitment to Christ and more effective discipleship. This includes the interpretation of scriptures, doctrine, organization, and ministries of the church. They assist the pastor through caring, leading, and communication. Examples are hospital visits, leading small groups, serving as liturgists, planning worship services, and bringing the message when the pastor is absent. Occasionally a lay servant is asked to lead worship at a different church. There are training classes to prepare someone who is called to this ministry. There is a basic class on sermon development and presentation and advanced classes in topics like worship planning, sermon preparation, leading corporate prayer, Methodist piety, etc. The classes are usually two full weekend days long. An advanced class must be completed within three years and a church conference must approve the person for certification. PFUMC has had a number of people who serve in this capacity, including Emmett Eary, Kathy Shaw, John Wester, Liz Klar, Kay Shout, Roxie Greenway, Rob Turk, and Donn German. Randy Nettles 2007–2010, Troy Werner 2011, Hillarie Smith 2011–2012, Ryan McDaniel 2012–2017, and Trevor Shaw 2017–2018. I had so many great musical experiences at PFUMC, and the congregation was so welcoming and friendly to me as a worship leader and fellow musician in many ways. I was the praise band director at Pflugerville First UMC from 2007–2010. As the new praise band director, I was working in several capacities. First, I was tasked with helping begin the new "Creekside Gathering" contemporary worship service, as the final piece of the puzzle included in an already full-speed, head-on, committee of all types of volunteers. We helped create the sound system, an A/V team to run the sound and video technology, the decor, the stage, the order of worship, and the "Creekside" sound that really blossomed in our Family Life Center. The service met at 11:15 and was led by Rev. Terry Dowdy. Band members included David Delguzzi on keys and bass, Tricia Lewis on vocals, Ken Goach on lead guitar, Ronnie Brown on the drums, and me on vocals and acoustic guitar; we ROCKED! We quickly started bringing in new families, new people in the congregation that were yearning for a different style of worship experience, and we were quickly at capacity in that space, including tables in the back with freshly brewed fair trade coffee and places for kids to color. In the meantime, I was also taking over for a very well-run and highly organized band of volunteer musicians, led by Clark Meier, at the early service in the beautiful sanctuary. We went from hosting all the music and chord charts on a homemade electronic software to a professional online church music organizer called Planning Center Online (which is still used today), with which we could share the plan for each service, the mp3's of the songs, the people playing and singing, and even the scriptures, sermons, and artwork and images used each week. We began using it for both Creekside and the early service, as well as youth worship. In addition, we began having one practice per week for the early service musicians where one band came early and the other later, so we could all share prayer concerns and celebrations and pray together in between. And everyone was called on to serve on both bands as back-ups if needed. Soon the service and the music really began to do well, and we had about 25–30 musicians and singers that rotated in and out of the worship service band and functioned as one music team. In addition, one of my tasks at PFUMC was to oversee the youth praise band and youth worship. So, as with Creekside, we held auditions with youth of all ages, started using Planning Center Online for our weekly music, and developed a praise band named After the One by one of the youth. Dana Maxey designed a T-shirt for everyone, we found more band equipment, we began using Easy Worship for the presentation software just like at Creekside, and we moved everything up into the youth "Attic" over the Fellowship Hall. We had weekly practices there with the help of volunteers like Ken Goach and the amazing youth staff, led by Amy (and Phil) Howell. Slowly I began to back out of leading the music with the youth, and they took over leading it themselves . . . and they were AWESOME! We even took all of our youth worship team and several band members to a Youth Praise Band Music Seminar at First UMC in Boerne to learn more of where to go from there. It was easy to see that the youth were beginning to take ownership of where they wanted THEIR youth music and worship to go in the future. Soon the church followed suit and spent money revamping the Attic and adding a stage, along with lighting and screens for a better youth worship experience. God really moved in MIGHTY ways during my three years as worship leader and praise band director at PFUMC. We even undertook a congregational survey of those at the early service and revamped it into a shorter, devotional-type service called, "Morning Glory," and it and the praise band seemed to be on a good trajectory for growth again. I truly enjoyed all of the music and worship we had there, and still consider the people in the congregation and the musicians that I had the pleasure to sing and make music with some of my good friends today. God is good! And, with his help, He will always lead us into new areas of ministry, build us up to be ready for the task, and make our experiences newer and more exciting each and every time . . . if we have the courage to boldly follow wherever He is calling us! I joined the church around 2005. I was brought up Methodist and my wife was Episcopalian. My family was attending church in Austin, and we wanted a church closer to home, so we came to Pflugerville First United Methodist Church. I was a part of the Creekside band when Randy Nettles came on board, along with others like Tricia Lewis, David Delguzzi, and Ronnie Brown. Randy came in and organized the band for the Creekside service, and we met weekly for practice, but we also shared fellowship, concerns, and time together in prayer. Being a part of the band was a way to connect with others in the church through music that led to a deeper relationship. I helped with the youth band as well, and along with others, we grew the youth band to about eight members, which also led to fellowship among the youth. I was involved at FUMC for around seven or eight months. I applied for the contemporary worship leader position, and I was mainly the Creekside and early service worship leader. I experienced the presence of God each week as we sought to lift Him up and give thanks for all that He has done. I felt led by the spirit in many ways as we worked to bring glory to God through worship and praise. In planning the services and working with the musicians, there was always a hope and expectation to be led by the spirit. Coming on board an already established team can be a challenge because there has already been a set way of doing things established, but the people at FUMC were gracious and allowed us to bring ideas, and together we were successful at making the services an enjoyable time for all. At least I hope it was, as it was for me. I grew tremendously, both in learning how to lead people in worship to God and in dealing with the varying tastes people have for music and worship styles. What brought me to FUMC twelve years ago was Pflaming Glory at a Deutschen Pfest parade. My work had a float in the parade, and we were right behind Pflaming Glory’s trailer. I thoroughly enjoyed their music. My husband, Chris, and I had been searching for a church home. He was raised Baptist and I was raised Lutheran. Instead of defaulting to our given denominations, we opted to try FUMC, and loved it! Chris and I helped create the Creekside Gathering, which started on Easter 2008. I assisted with coffee, and Chris worked with sound. In 2009, I joined the praise band as a singer. Creekside aimed to make folks who did not grow up in church more comfortable with church. Singing is how I primarily like to worship. The music and words just speak to me. I love sharing Christ with others through song. Some of the pioneers that led the creation of the Creekside service were Pastor Terry Dowdy and Randy Nettles as the band and worship leader. Some of the team members I work with currently are Trevor Shaw (leader), Russ Somers, Ken Goach, and Jennifer Whitwell. Occasionally Barry Day plays too. Percussionists are James Minor and Clark Meier. We have had five praise band leaders in 10 years. The service attendance ebbs and flows, but I think folks always enjoy the music. And I love singing and sharing Christ with others through singing. We have changed the name from Creekside Gathering to the 11:15 service. Little nuances within the service and atmosphere have changed, but overall it is still the contemporary service that the church offers. The band members, the music, and my friends at church are what keep me involved with this ministry and service. Who are we, and why are we here? We are FUMC! We love God and hope to share that with others! I believe that to make improvements to this ministry we must not allow “that’s the way it’s always been done” to rule the church. Change, as awkward (and maybe painful) as it is, is healthy. And we must be the change we want to see. I was a worship leader at FUMC from 2012–2017. I was also involved in Go Day and led a small group for three years. The worship ministry had begun earlier, and I believe it was aimed at being a little more casual and modern than the services in the sanctuary. Worship is an integral part of Christian life. Worshipping through song helps us connect to God in a more emotional and outwardly expressive way. It’s also significant that we worship in a congregation because it helps build community. It’s always been my hope in worship that people would seek the Lord with their hearts as they declare the truth of who He is and what He has done. I depended on the Holy Spirit for wisdom and guidance as far as the songs I would choose to sing and how to best care for the volunteers on the worship team. Obviously it’s up to the Holy Spirit how He chooses to move within a gathering, and I would pray that He could move in people’s lives. The pastors were, of course, some of my ministry teammates, but my main teammates were the members of the worship team. This included those who played instruments and sang, but also the people who would help set up chairs and run sound and slides. Ken Goach, Russ Somers, Tricia Lewis, Alan Torok, Jennifer Whitwell, Jason Bradford, Robert Barnes, Jessica McDaniel, Matt Rutkowski, Mike Clements, and Linda Glasgow Clements were some of those involved. I think one of the main challenges of my particular ministry was how it fit (or didn’t fit) into the overall vision and mission of the church. It seemed that some saw it as a separate ministry of the church, and I don’t think that helped it grow or thrive like it could have. I don’t know that these challenges were ever overcome. I think the music ministry was effective in some ways. I feel like the worship team was united in our team mission. I also feel like we had support from the pastors and several regular attendees of that worship service. People would tell me that they felt God’s presence when we led or that a specific song really spoke to them. In the five years I was there I think the worship team became more united in our mission. Although I was the only paid member, the team really took seriously the time that we put into the ministry. Everyone came prepared and really brought their best effort. People were willing to stretch themselves to improve in their playing and/or singing. I think the mission statement of the Methodist Church is pretty on target: To make disciples of Jesus Christ for the transformation of the world. I think that in any ministry we participate in for a while, the natural tendency can be to drift away from the “who are we and why are we here” questions. We get used to the routine of doing something each week, and it can be natural to forget why we do it. As Christians, the answer is always found in remembering who Christ is. We do ministry not because it belongs to us—we do ministry because it belongs to Christ, because He alone can accomplish His purposes. Outside of His will we can do nothing. So I think in a large part, ministry is effective to the extent that we are looking to Jesus, trusting Jesus, depending on Jesus for the outcome. My prayer for future generations is to go wherever you see Jesus doing ministry. Find a place where you see the Holy Spirit moving powerfully and join in His ministry. Go where you see the fruits of the Spirit alive and growing in people and find a way to serve.